1.Chilling with my favourite girly! 2.Phoebe! 3.The weather was too nice to be going to work! 4.Going out to dinner with my girls :) 5.My breakfast! 6.Posing in the bathroom! ;) 7.Still working on my essay! 8.Old photo from holiday! 9.I tucked Phoebes top in her leggings! Simon Cowell, eat your heart out ;) 10.One of my favourite movies and favourites actors! So sad he's died :( 11.Watching Suits with Mumma! 12. People are unable to spell my name! :( 13.Last minute psychology work before I went back to college! 14.Got invited to an event but can't go because I'm working! :( 15.Psychology work! Snore! 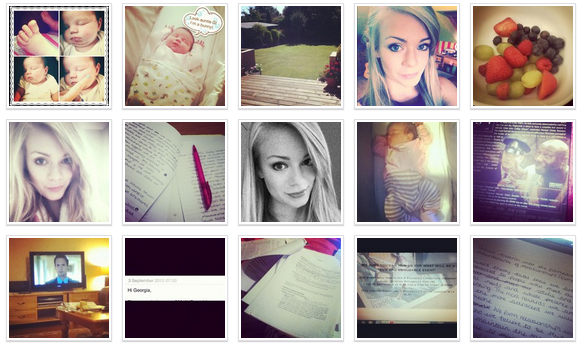 I think it's clear, I have been Instagramming A LOT more recently! About 50 photos every day! Haha! I'm so sorry for not posting recently, bad blogger!! I am having my blog re-designed and didn't want to publish a post and then have to private my blog (while adding the new template) so no one could read it! The mock up of my design is done, so now all is needed to do is for it to be added and the last finishing touches to be done. I have to say I am SO happy with it, I will do a post on who designed it for me as I love it and would totally recommend the person who has done it! Speak to you lovely lot soon! I so need Instagram in my life! Hi to all,I am new person to the blog.The photos in the blog is very nice and interesting.Keep update more things in the blog.